Hello! My card today is for this week's Tuesday Throwdown challenge sponsored by Sweet 'n Sassy Stamps. The theme is to use your die-cuts and I am using Cocoa's Gift set. I pulled out papers from my stash for this birthday card. I colored in Cocoa using Copic markers and added some white dots using a white gel pen. I cut out the label using the square scalloped Spellbinder's die. 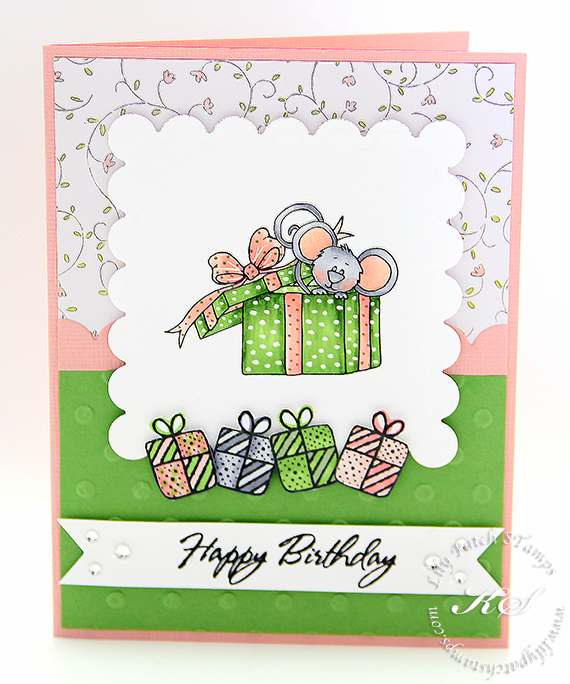 The pink scalloped piece was done using Sweet 'n Sassy Stamps scalloped die. I also did some embossing on the green cardstock. I also stamped some presents from Fun 'n Flair's (retired co.) Christmas set. I used the same color combos on these presents as I did Cocoa's image. The birthday sentiment was stamped and freehand cut to create a banner. Please joining the DT over at the TT blog for more DT inspirations and enter to win a fun prize from SNSS. Lovely card! Thank you for playing with us this month at A Beautiful Mess!Looking forward to see you again next challenge. Aaaaw! What a lovely, Kim. Beautiful soft colours. What a sweet creation! Thanks so much for joining us at Robyn’s Fetish challenge! I hope you’ll come back again soon! Such an adorable card! I love the sweet image and your spring color palette makes me smile on this rainy day! 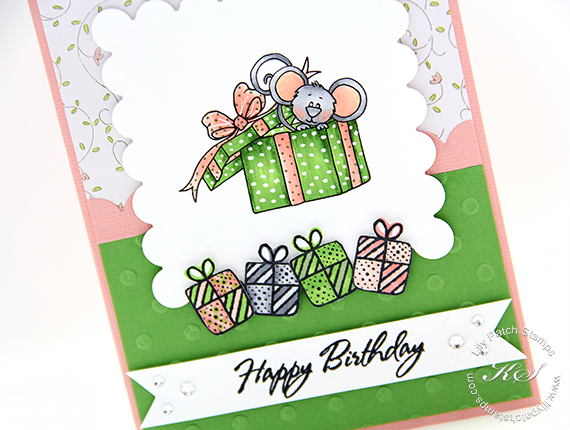 Great card, I love the way you've matched up the dotty embossed card with your coloured image.